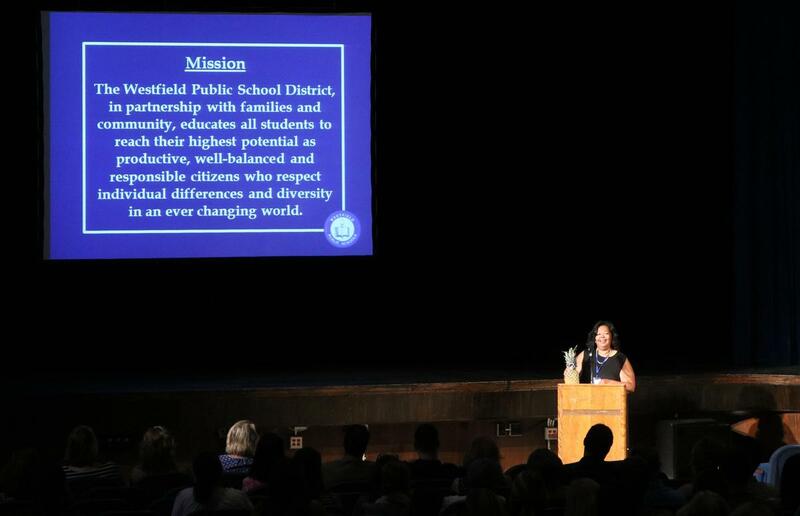 Superintendent Dr. Margaret Dolan welcomed back staff on Tuesday, Sept. 4, as the 2018-2019 school year for the Westfield Public School District gets underway. 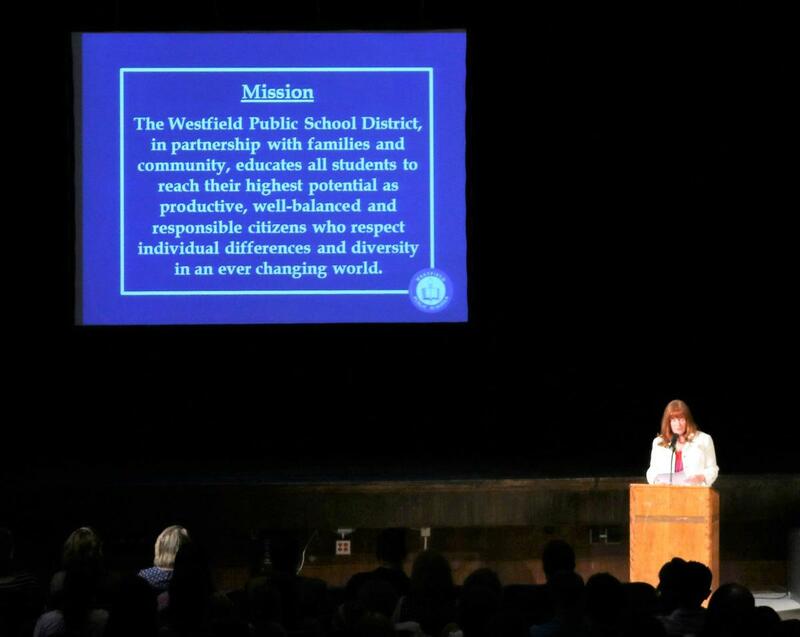 Superintendent Dr. Margaret Dolan welcomed back staff on Tuesday, Sept. 4, as the 2018-2019 school year for the Westfield Public School District gets underway tomorrow. 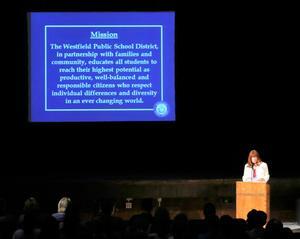 Dolan praised the custodial and maintenance staff, technology team, support staff and administrators who work through the summer to prepare the district’s schools and buildings for the return of staff and students on Wednesday, Sept. 5. More than 900 staff members will join approximately 6,300 students as the district’s 10 schools open tomorrow for a new school year. Board of Education president Gretchan Ohlig and Westfield Education Association president Gail Alston also were on hand to welcome the staff. A strong commitment to a safe and secure school environment. Administrators met over the summer with Stonegate, the district’s security consultant, to review the newest recommendations regarding security procedures. Stonegate also walked every building with principals and custodians this summer. Administrators and staff meet routinely throughout the year to continue to review security procedures while additional cameras, new doors and other enhancements will be installed districtwide. A new science curriculum in the elementary schools with an increased focus on student inquiry and exploration that aligns with the Next Generation Science Standards. Continued investment in technology at all of the ten schools as the district rolled out additional Chromebooks, improved the district’s data center, and helped to create an Innovation Classroom at Westfield High School. Thanks to a generous donation by the Westfield Foundation, this state-of-the-art classroom will support and expand the engineering and technology curricula, as well as the Robotics Team. A new district website was launched on August 1 with a clean, fresh look and ease of navigation that is the result of more than a year of thorough research and conversations with various stakeholders. Administrators attended a three-day workshop this summer which focused on the interconnection between Social and Emotional Learning and academics as the district continues to build on its health and wellness goals. 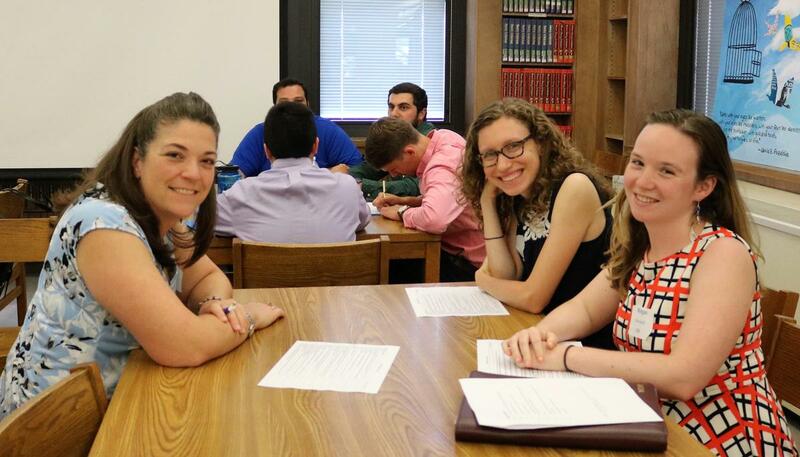 The Westfield Public School District also welcomes nearly 40 teaching professionals for 2018-2019. The new staff members attended a two-day, in-house orientation on August 28 and 29 as part of the New Staff Institute (NSI). 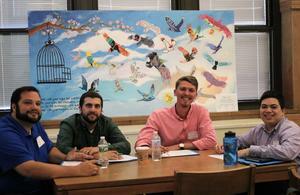 The NSI is a two-year program designed to support first-time educators and those who are new to the district. 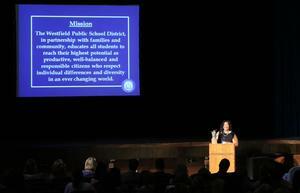 The comprehensive program is organized by Human Resources Specialist Barbara Ball and her staff along with a leadership team comprised of seasoned Westfield educators.